"This moist, light cake is "berry" delicious as a dessert or for breakfast. Your house will smell just wonderful while it is baking and cooling. Recipe doubles well." Preheat oven to 350 degrees F (175 degrees C). Spray an 8 inch round cake pan with cooking spray. Combine raspberries and brown sugar in a bowl. Set aside. In a large bowl, combine flour, sugar, baking soda, baking powder, and salt. Combine sour cream, butter or margarine, 1 teaspoon vanilla, and egg, and add to flour mixture. Stir just until moist. Spoon 2/3 of the batter into the prepared pan. Spread raspberry mixture evenly over the batter. Spoon remaining batter over raspberry mixture. 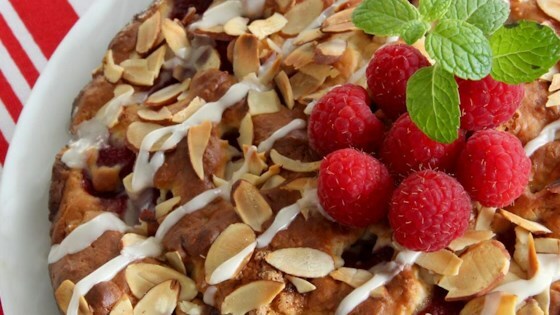 Top with almonds. Bake for 40 minutes, or until a wooden pick inserted in center comes out clean. Let cool for 10 minutes on a wire rack. Combine confectioners' sugar, milk, and 1/4 teaspoon vanilla. Stir well. Drizzle glaze over cake. Serve warm or at room temperature. I'm not feeling the love! I followed the recipe exactly and it didn't turn out at all. The batter was very difficult to work with. The end product was unevenly cooked and didn't taste well. This was a great cake! I used almond extract instead of vanilla & raspberry yogurt instead of sour cream & it turned out wonderful. Can't wait to make it again! !